When you book using this official service, you only pay the cost of the test there is no extra booking fee. The DVSA theory test for cars is split into two parts: The multiple choice/ response quiz and the hazard perception test. Part One - Multiple choice/response quiz. 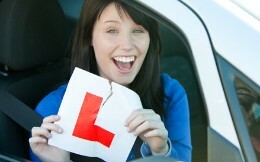 The multiple choice/response quiz for car drivers consists of fifty questions. Associated with each question is a list of potential answers. You need to select the correct answer (or answers), by touching the appropriate area of the computer screen. You will be given 57 minutes to complete the test. To pass you must correctly answer 43 out of the 50 questions. (i.e. 86%). Part Two - Hazard perception test. This part of the theory test will start with a short tutorial video played on the computer screen. This will explain how the hazard perception test works and what you are required to do. You will then be shown 14 video clips of approx. one minute each. There are 15 hazards to find - one on each clip. However, one clip will have 2 hazards. If you fail part one or part two you must re-sit the entire test! Visit the official DVSA Learning Zone. The ultimate online theory test revision product.